Specair is a program for computing, manipulating and fitting spectra. 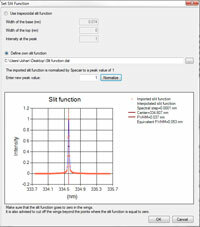 In just a few easy steps, the user-friendly interface of Specair 3.0 allows you to compute high precision, absolute emission and absorption spectra of many transitions commonly observed in plasmas and reactive gases: 23 transitions from eleven species from the vacuum ultraviolet to the mid-infrared. Specair can automatically identify the main transitions in your spectrum. 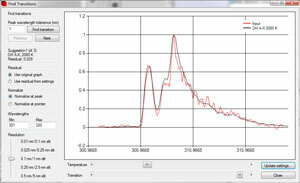 You can fit your spectra using the numerical optimization routines in Specair. A mathematically best fit of the temperatures and mole fractions is done automatically by the program, sometimes within seconds. Specair comes with an intuitive user interface that easily lets you compare and manipulate calculated and imported spectra. Specair lets you use either a trapezoidal slit function (note that a gaussian slit function has practically the same shape as a triangle of the same Full Width at Half Maximum), or your own slit function. The slit function enables one to reproduce the apparatus slit function of a given experiment. Specair lets the user choose translational, electronic, vibrational and rotational temperatures individually. The code then uses Boltzmann distributions at the electronic, vibrational, and rotational temperature to determine the population of the internal energy levels. Specair lets you take into account the effect of absorption by room air between the emitting gas or plasma and the detector. Important absorbing species in room temperature air at normal temperature and pressure are H20 and CO2 in the infrared and O2 (O2 Schuman-Runge continuum below 185 nm).